If you think how we today produce and consume goods it is evident that the current system is not all that future-proof. Increasing global population and diminishing resources form an equation that forces one to ask if there is no other alternative. I believe there is. During my mandate as the European Commission Vice-President responsible for Jobs, Growth, Investment and Competitiveness, I have set as my goal to continuously modernise the European economy and to challenge old habits. One strand of my work has been the creation of the European Circular Economy agenda. Circular Economy aims to replace the current linear consumption models with more circular ones. Instead of producing and throwing away materials, we would throw the used materials back to use and production. The core idea is resource efficiency and with efficiency we will deliver gains not only for the environment, but also for the businesses and consumers. To make Circular Economy reality, the Commission published in 2015 the first ever Circular Economy action plan. One deliverable of this broad action plan was the Plastic Strategy, which the Commission presented this January. It is clear that plastics are essential for our economy and as key enabling materials provide functionalities for many sectors. Our work is aimed at helping the European industry to become the most innovative and competitive in the world. Today less than 30% of plastic waste generated in the EU is recycled. Annually, the EU plastic demand reaches 49 million tons: the main driver being the packaging sector, followed by the construction and automotive sectors. One of the main aims of our Plastic Strategy is that all packaging plastic would be recyclable by 2030. We also aim at incorporating 10 million tons of recycled plastic into new products every year. For this we have launched an EU-wide pledging campaign for businesses where they can submit voluntary pledges for the uptake of recycled plastics in their products. We are also reaching out to regional and municipal authorities who have a key role in bringing policy in to practice. Change requires new innovations. So far, the EU´s Research programme Horizon 2020 has provided over EUR 250 million to finance research and development in areas of direct relevance to the strategy. In the run-up to 2020, we will deploy an additional EUR 100 million. In the worst case, plastics end up in the environment. In the EU, from 150 000 to 500 000 tonnes of plastic waste enter the oceans every year. This is fuelled by the growing consumption of ‘single-use’ articles made of plastics, rarely recycled and prone to being littered. These items include small packaging, bags, disposable cups, lids, straws and cutlery. The data collected confirm that single-use plastic items represent 50% of marine litter, while fishing gear represents a further 27%. 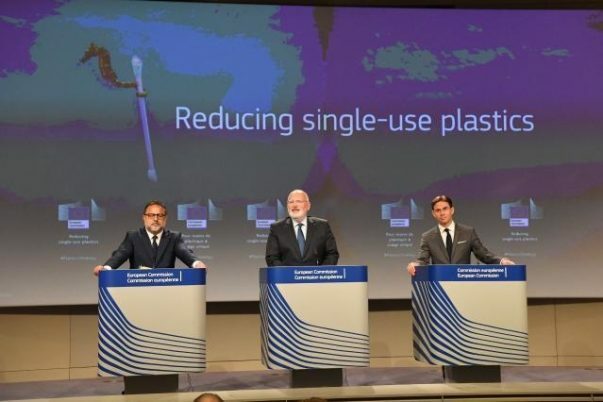 Following the Plastic Strategy, the Commission submitted a proposal to reduce unsustainable use of single use plastics. The aim of the directive is to give Members States a tool for taking action where they envisage the need. Like our Plastic Strategy, this directive is not against plastics per se. In fact, we proposed different levels of action, taking into account the consumer behaviour as well as consumer needs and opportunities for businesses. We acted not only because of the environment, but also to create opportunities for more sustainable alternatives. This creates possibilities for products that are made of renewable raw materials, like renewable plastics or various cellulose-based products that can be used to replace plastics. With the help of good sustainable examples we can pave the way for new innovative products of the future. Producers situated outside the EU, but willing to sell their products in the Union, will also have to follow these rules thereby helping the EU to set global standards. I am convinced that tomorrow will be more circular and that the EU must lead in Circular Economy solutions. By using our Single Market when setting good examples and standards, I am sure we are better placed to provide our companies a competitive edge, while also convincing our global partners to mobilise and do their part. The author Jyrki Katainen is the European Commission’s Vice-President for jobs, growth, investment and competitiveness. 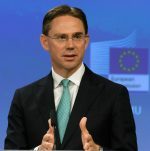 Mr. Katainen has had an active role in developing the Circular Economy and preparing the European Strategy for Plastics that was launched in January 2018. In this #BioChallenge blog series decision makers and leading experts from different parts of Europe raise important development issues which can be answered with bioeconomy-based solutions.